Pope Francis has urged Christians and Muslims to work together to promote mutual respect, particularly by educating new generations of believers. He greeted Muslims around the world during his Sunday blessing of pilgrims gathered in St Peter's Square in Rome. He said that "our brothers'' the Muslims had just concluded their holy month of Ramadan, dedicated to fasting, prayer and alms-giving. 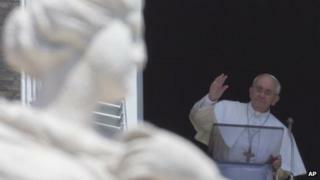 The Pope spoke from his studio window overlooking the square. The BBC's David Willey in Rome says Pope Francis, who has made caring for the poor the landmark theme of his pontificate, addressed tens of thousands of pilgrims gathered in scorching summer heat. Unlike his predecessors who spent their summers in the papal villa at Castel Gandolfo outside the Italian capital, where the weather is slightly cooler, the Pope has chosen to continue working at the Vatican during the summer holidays. Our correspondent says he is preparing major reforms of the Vatican bureaucracy as a result of scandals involving Vatican finances and clerical sexual abuse of minors.